For me, summer starts with the first Friday show at South Street Seaport... which this year is tomorrow, though there won't be another till July 11. The Seaport Music series is always such a good way to kick off weekends, when it's not raining or the pier is being attacked by swarms of insects. (The latter only happened once, during Camera Obscura last year but it was really freaky.) This year's lineup -- what they've announced so far looks good. It will be interesting to see just how loud A Place to Bury Strangers will be allowed to play, and how much it will scare the tourists. Reformation and reunion shows can be dicey affairs, but Wire are not nostalgists by nature and have been active since getting back together in 2000 after a 8-year vacation. I saw Wire when they played Irving Plaza back in 2000 around the time of their reformation and, I must admit, my biggest memory of that show is that I sold my extra ticket to a scalper to which I was given a counterfeit $20... of course I didn't realize it till I used it at Irving Plaza's bar. (I didn't get kicked out, and still have that funny money somewhere... and haven't dealt with scalpers since.) My memory of the show is that they didn't do any classics apart from "12xU" and "Drill" but a quick Google search is that it was almost entirely oldies nicely plucked from throughout their career. We'll hear more tomorrow when Wire play the first Seaport show of the 2008 season. Filling Bruce Gilbert's spot on guitar will be Margaret Fielder who was in Moonshake and Laika, the latter of whom did a great version of Wire's "German Shepards" for the 1994 Wire tribute CD, WHORE. A setlist from Manchester's Futuresonic festival earlier this month looks like mostly new stuff, with some old nuggets ("Boiling Boy," "The 15th," "Lowdown," "12XU," "106 Beats That") thrown in as well, but don't be surprised if they show up in radically reworked versions. Wire aren't much for nostalgia. The essential first three Wire albums were reissued in 2006 on Wire's label, Pink Flag, and sound great. Actually, I recommend just about everything Wire's ever done, even the very synthy 1991 Wir album (no "e" as drummer Robert Gotobed had left the band), The First Letter. Only 1990's Manscape is skippable. If you're heading down to the Seaport tomorrow and look to drink on the cheap, there's a fish-n-chips place in the back of the top floor Seaport food court that sells 32 oz styrofoam cups of beer for next to nothing. It's definitely the way to go. For more info, visit the River to River website. 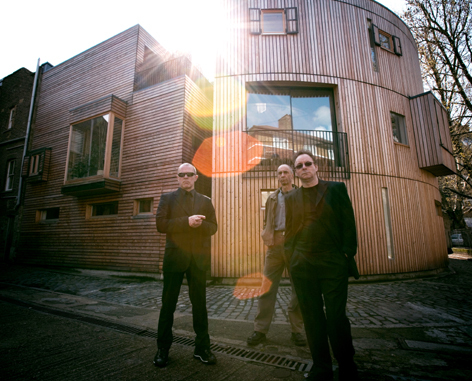 Wire is one of the best bands in the history of everything pretty much. Still frustrated that I've never been able to see them, but a new album this year is definitely exciting. that new song bodes well for the new record - a cross of 154 and ideal copy. to Borat... I tried writing you back but the email address was fake. Either provide a real one or continue to get all your comments deleted. On The sewer people stole my skateboard!